It has become a tradition in the EU, inspired by the US president's annual address to Congress. 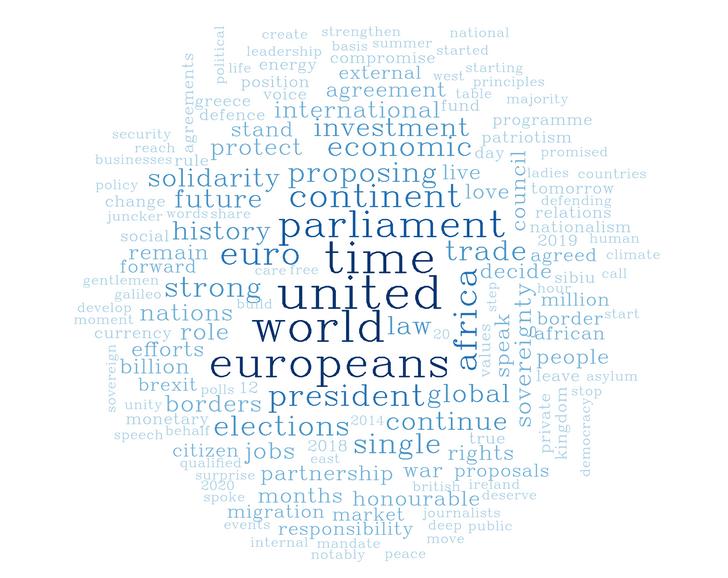 On Wednesday morning (12 September), the European Commission president Jean-Claude Juncker delivered the State of the European Union speech, also known as SOTEU, at the European Parliament in Strasbourg. It was the fourth, and probably the last, time that Juncker addressed the MEPs. In May next year, a new parliament will be elected and in September it is expected to be busy with approving the new college of commissioners appointed by member states. This year's SOTEU was therefore special, and for Juncker an opportunity to review his achievements and set out a vision for the EU he will leave behind at the end of his term. Amid renewed concerns over the rise of far-right and anti-EU forces in Europe, Juncker's speech was meant to be a political answer to citizens' concerns and his institution's positions on issues debated by EU leaders – on migration, the economy or social policies, as well as on the place of the bloc in the world. 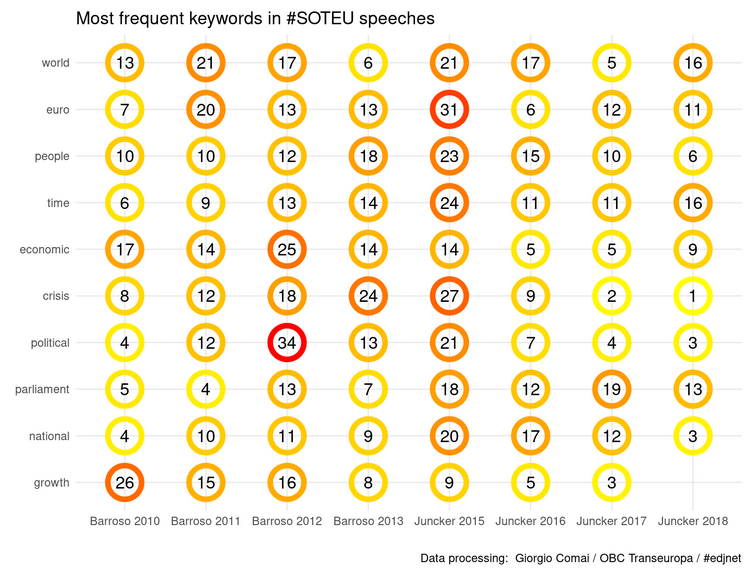 The figure refers to the most frequent words in all SOTEU speeches pronounced by José Manuel Barroso and Jean-Claude Juncker, so to say the keywords that have dominated the EU in the last decade. It shows the number of times that each of these words was pronounced in each of the speeches. The colour of the circle reflects these data, with red reflecting more mentions. 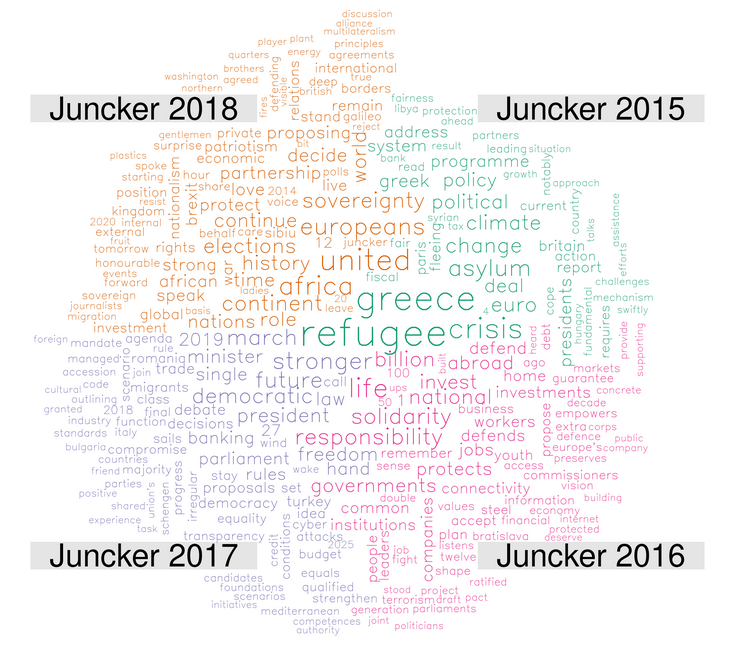 The following wordcloud compares the relative frequency of keywords across Juncker's four speeches (recurring terms have been excluded), showing the words that are most frequent in each of the speeches and are at the same time less frequently found in other speeches. 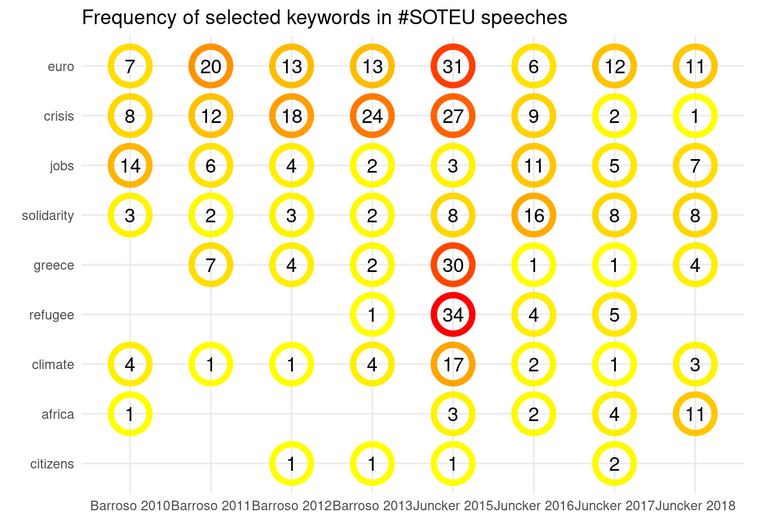 This chart shows the number of times a few keywords were pronounced during each of Barroso's and Juncker's speeches. The colour of the circle reflects these data, with red reflecting more mentions. Here, we chose to monitor some of the most salient words, not the most used. 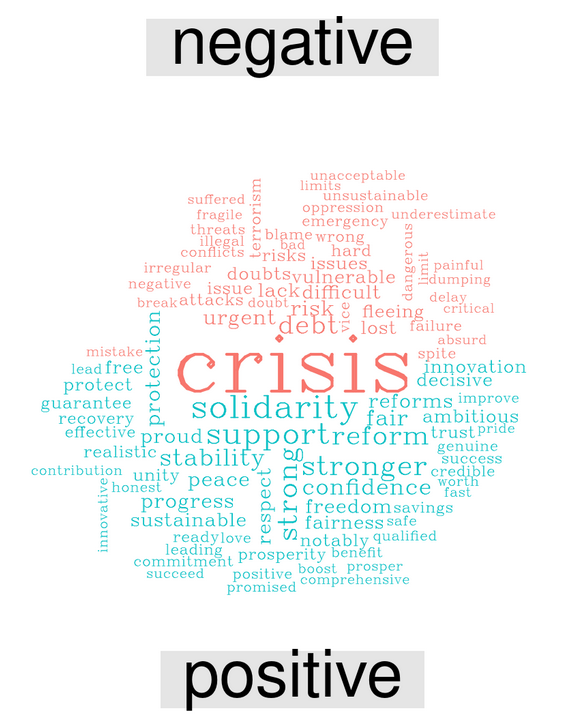 Finally, these wordclouds show the balance between positively and negatively connoted words used in SOTEU speeches. 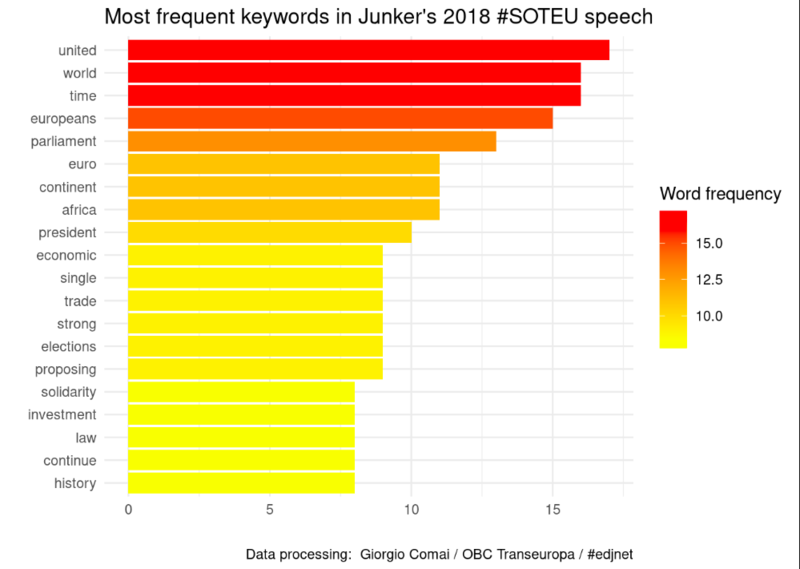 The following cloud refers to the 2018 Juncker SOTEU speech, while the one below it includes all the SOTEU speeches made by Barroso and Juncker: the word "crisis" has dominated this decade, but it is does no longer come out on top.